Respect at work? Not here, on the pitch or in the kitchen. As an avid reader of Twitter & lover of people’s 140 character opinions, I’ve been fascinated in the last 12hrs with the diametrically opposing positions regarding employment in the UK – who deserves respect and fair treatment and who deserves ridicule and fair game treatment. One the one hand we had Restaurant Wars last night at 8, a behind the scenes look at two egotistical, talented British chefs striving for Michelin stardom in Manchester. My timeline went bananas over employee rights as the show revealed long hours, aggressive chef rantings at young employees and poor pay. Seems like the UK is a pretty right-on place, with much on-line consternation & genuine shock at the idea individuals could be so badly treated at work, belittled and treated like pieces of meat to be roasted as their careers headed for the door. The Twitter knives were sharpened for those nasty employers with so little thought or respect for their poor employees. Oh, hang on….. *sleeps 8hrs*…….here’s another bloke who’s not done quite as well as expected and has just lost his job in the most public way possible. Let’s see what Twitter had to say about him…. Yes, let’s. Let’s send a BBC crew live in the hope of seeing an ashen faced man, humiliated, turn up at somewhere he might no longer have a job, regardless of his pay off. Let’s compare him to a disease ridden dog. Or maybe have a fun punt on his future. Personally speaking, I don’t think it matters what your renumeration package is with regard to being treated with respect and dignity at work or as you head for the door. I’m no wet fart, I spent years working in and loving the intensity of city centre kitchens and restaurants and I get the high pressure nature of football management, I just found the two completely different approaches to essentially the same subject amazing. 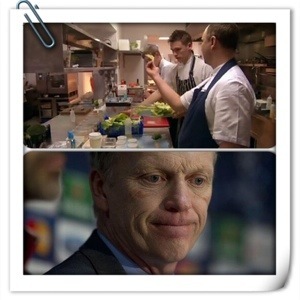 The Twitter /press glee over Moyes’ sacking is as distasteful as The French’s treatment of their pressured young chefs, but it appears that it’s ok to revel in someone losing their job and being ridiculed in public if their bank balance is higher than average. Not so sure myself, whether there should be two sets of ethics.